'Supergirl' season one comes to an end tonight as the season finale entitled "Better Angels" promises some major developments and rumors of a possible death. Non and Indigo have plans to destroy humanity and they've pit a mind-controlled, kryptonite sword-wielding Alex against her sister Kara. Check out these previews before the epic finale. 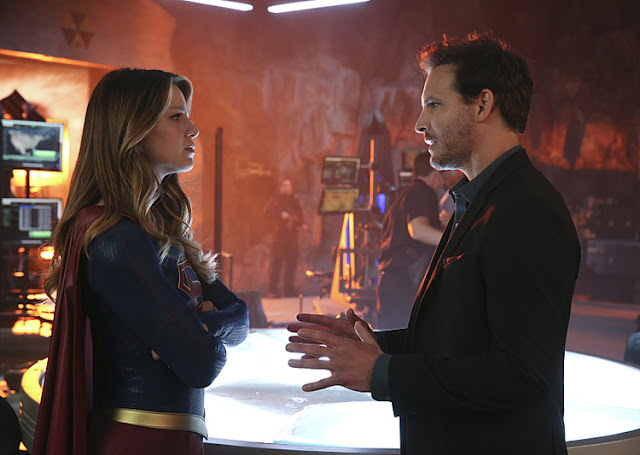 It's Supergirl versus her sister Alex, Maxwell Lord races against time to try and break Non's spell on the citizens of National City including the Man of Steel, and take a look behind the scenes of the finale with the cast brought to you by DC All Access. No word from CBS if 'Supergirl' will get renewed for a second season which makes this finale even more important. Could monster ratings for the finale help convince the network? They couldn't hurt but the superhero series has had respectable numbers although probably low by CBS standards. The quality of the show has gotten better over the course of its freshman season providing plenty of fan-favorite moments with villains from the comics. The crossover episode with CW's Flash brought a huge bump in ratings. Star Melissa Benoist has been the show's strength throughout the season and the show deserves another year to grow into a bigger hit. 'Supergirl' airs Monday, April 18 at 8/7c on CBS.